After Ireland’s ‘shock’ defeat to Scotland in the opening round we analyse why it shouldn’t come as a surprise, what Ireland should change and what could unfold in the Six Nations in the next few weeks. Going into the first round no one could predict an Irish defeat, it was all about the Grand Slam and Ireland Vs England. However, this has been coming for a while and Scotland have assembled a strong side that has been developing and grinding out results against big teams. Schmidt’s former mentor, Vern Cotter, has slowly improved the Scots and this first came to recognition in the 2015 World Cup when they lost out to a controversial last minute kick to that year’s finalists Australia. They continued this form last year but the Six Nations proved only a learning platform for the young team as their inability to finish out games cost them dear…until now. Youth has been a big factor in Scotland’s growth. Stuart Hogg and Finn Russell have certainly taken all the headlines in this area but players like Jonny Gray and Huw Jones have also led the resurgence of this Scottish outfit. This new wave of Scottish talent has certainly shown this in their performances at club and international level so why are many pundits and fans doubting the Scots in this Six Nations. The answer simply is their history in the competition. Before the Ireland game, they had the same win record as Italy with only 10 wins in 60 games and when you see that it’s hard to believe they can produce a team capable of beating Ireland, England, Wales or France. This team is fair different from those of before and under the coaching of Cotter it’s not inconceivable for this Scottish team to get a top 3 finish in this year’s Championship. What Do Ireland Do Now? Well obviously it wasn’t the most ideal start for Joe Schmidt’s men and they are going to need a big turnaround in order to have a chance in this year’s Championship. The introduction of the bonus point system may come as a big advantage to the men in green as they managed to grab a losing bonus point in Murrayfield. A perfect Six Nations is required from now on and this includes try bonus point wins against vulnerable teams like Italy and Wales. Schmidt’s men also require a slip up from their English counterparts which seems possible after they required a late try to defeat the French in Twickenham. Eddie Jones’ men looked shaky in the first half in London and if they do this against a concentrated Ireland or Scotland it is hard to see them coming out on top. I’m not saying it will be easy for Ireland to regain their form after that disastrous first half against the Scots – in fact, Schmidt and his coaching staff will have to make some significant changes before they can even consider beating England. The first thing they must change is team selection. This means not one player should be guaranteed the jersey week in week out and it should first come to down to form and then skill. No player should be guaranteed a shirt on the basis of reputation. Two players certainly spring to mind in this category, Rob Kearney and Jamie Heaslip, who I believe have been past their best for quite some time yet still manage to be constant names for Ireland. Although I do believe Heaslip’s selection for the Scotland game was justified after what was an excellent November Series and the injury to Peter O’Mahony, it soon became apparent that his lack of effective contributions around the field, a problem of many campaigns gone by.would raise it’s head once more .Heaslip never had any forward momentum, he wasn’t a constant presence at ruck time and he lacked the speed and power that other number eights in the competition possess. Corkman O’Mahony was missed dearly as Scotland destroyed Ireland at the break down and lineout, which in turn led to Ireland’s inability to put the Scots under any serious pressure. There needs to be a real switch up in the Irish back-row in order for them to succeed and this definitely includes CJ Stander starting at Number 8. Is this the end for Jamie And Rob? In the case of Kearney it is becoming increasingly difficult for Schmidt to justify his usual selection with players like Simon Zebo and Tiernan O’Halloran consistently playing brilliant rugby at provincial level. The Scotland game may be the beginning of the end for the Leinster man as his defensive capabilities were exploited again and many pointed the finger at him for Scotland’s opener. The X factor he possessed in his younger years seems to have vanished and all he truly has left is his excellent aerial ability. Unfortunately for him, Zebo and O’Halloran have serious fielding qualities of their own in addition to their superior offensive and defensive capabilities. This brings me onto Ireland’s defense which yesterday was a shambles and came as a big surprise to us as Ireland’s defense has been the strong point of most matches ever since Andy Farrell was brought in. I think the loss of Payne and Trimble contributed heavily in this area as young Ringrose seemed somewhat lost for most of the game defensively. As a result, Ireland defended narrowly which gave Scotland and especially Hogg much room to break on the outside. Farrell will be disappointed with this performance but they will probably spend the next few weeks correcting this problem to avoid being exploited, and possibly embarrassed, by England’s impressive centre partnership later on in the competition. 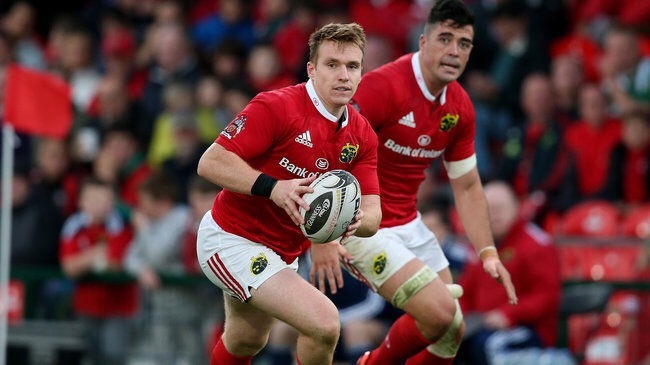 Next week’s Italy game comes at a prime time for Schmidt’s men as he can experiment with a lot of players such as Rory Scannell who has been a hallmark for Munster’s excellent defense this season. Could this man prove to be a strong replacement for Payne? Although this game was a shock there is no need to panic, it may be an uphill battle from here but Ireland have the pieces to the puzzle and all they need to do is put them together to turn this campaign around.